The Windows™ based LG-Audit Setup Software has a user-friendly interface, which allows the lock to be configured directly from a PC. Software features include the ability to vary combination lengths, user activation, lock mode selection, external signal mode selection (used with the 2789 and 4002 alarm boxes) and the setting of time delay values. The LG-View Auditing Software is an essential tool for loss prevention, featuring a searchable audit trail with time and date stamp which provides knowledge of who accessed the lock and when. 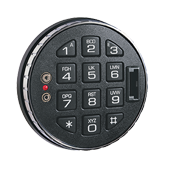 This is for the lock stated with standard auditgard keypad as shown, if you require eKeys please call before ordering for the additional costs. If you require the lock pre-programmed please call us stating time delay, number of users etc required. This lock comes complete with Software.. If you require this lock to be installed please phone 01933 675551 for quotation.